Provides peace of mind through clever design. Safety made easy. The large liner handles, V-shaped jars and the jar's locking clasp enable single-handed operation. Closed system with high-flow bacteria (99.999% retention) and overflow filter, smoke pre-filter and patient backflow valve. Double layered, highly burst-resistant1 PA/PE foil ensures optimum protection. 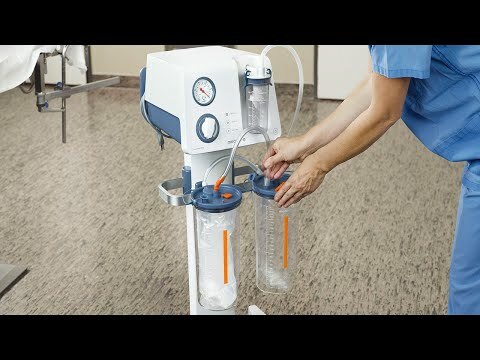 Easy to connect to Medela's suction pumps or wall suction solutions. All liners are equipped with multiple safety features such as an overflow and bacteria filter, a smoke pre-filter and a non-return valve to prevent back-flow. The hard-top lid seals precisely and immediately enable operation at low noise levels. Thanks to one single vacuum connection , no extra tubing needs to be connected with every liner exchange. Optional solidifier models eliminate the risk of spilling and may reduce cost of disposal. (Depending on local disposal regulations). Setups with serial connection enables handling of large volumes up to 22 litres. The vacuum is immediately applied through the hard-top lids, which snap onto the jar easily and are a perfect fit. The Vacuum tubing is made from silicone with a choice of port connections. To protect from overflow, bacteria and to neutralise odours. 1- Performance data on file Medela AG.